Airmarine was founded in 1960 to provide metal finishing and machine shop services to the local aerospace defense industry. Grumman Aerospace and Republic Aviation were producing vast numbers of military aircraft for the United States Navy and United States Air Force. Our shop provided the crucial plating, NDT and machine services necessary to manufacture the landing gear and hydraulic systems for the F-14 Tomcat, A-6 Intruder, E-2 Hawkeye, A-10 Wart Hog and F-111 Ardvark. We even provided support for NASA and their landmark Apollo and LEM programs. In 1975 our focus transitioned to corporate aviation and regional airline platforms. Our customers have come to depend on our quality, attention to turn time and competitive pricing for engineered electroplating coatings, Non-Destructive Testing and machine services. 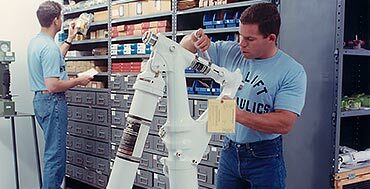 Our extensive experience in the salvage and repair of expensive landing gear components that many competitors decline due to complex configurations, bulk or cost is renown. We consistently meet or exceed our customers purchase order requirements. Our rejection rate is one of the industries lowest, below 0.2%. That commitment to service is backed by and unprecedented two (2) year warranty on all work that is accompanied by an FAA 8130 certification. When needed, we can meet any AOG or special, expedite delivery schedules. Our facility and staff are on call 24/7 to provide premium service.